Leader of the Indigenous People of Biafra, IPOB, Nnamdi Kanu has released six ‘scientific’ facts to back his claim that one Jubril Aminu Al-Sudani is impersonating President Muhammadu Buhari. Kanu spoke Saturday night in a two-and-half hour special radio broadcast from Israel, saying the facts were necessary to clarify the point he raised earlier that what was playing out before Nigerians was not a case of President Buhari’s clone in Aso Rock but a body double. While he admitted that body doubles were used by world leaders in the 70’s as political decoys, the IPOB leader said they were never allowed to rule over state affairs nor sign official documents as in the present scenario. In the past few days, the Presidency of Nigeria has worked very hard to put a spin on the credible revelations that the man passing off as President of Nigeria is not Buhari but a Jubril from Sudan. The spin runs like this: That Buhari does not have a ‘clone’ or that Jubril is not Buhari’s clone or that Buhari has not been biologically cloned. Even ‘Jubril’ himself, during his current trip to Poland, claimed that he is the ‘real’ Buhari, not a ‘clone’. “The standard qualification to becoming a successful body double or impersonator is close resemblance to the person being impersonated. In other words, the political decoy is an individual who has been selected because of strong physical resemblance to the person being impersonated. This resemblance can be strengthened by plastic surgery. “Often, such decoys are also trained to speak and behave like the person being impersonated. It has happened before in history, most notably with Josef Stalin of defunct Soviet Union and Adolf Hitler of Germany. There were many others, especially during the Second World War and the subsequent Cold War, when it was very rampant with spies and espionage. “In this very case of late Buhari, Jibril is NOT a biological clone but a body-double, another human being, an impersonator from Sudan, who resembles Buhari, then underwent a few plastic surgeries to make the resemblance closer and got coached to speak and act like the real Buhari. “What they never reckoned with is that there are no two individuals that look exactly alike, except for identical twins, even so to a less than absolute degree. So, even as Mr Jibril looks like late Buhari and did some few fixes to enhance the resemblance, there are still a few give-always that, to a discerning eye, differentiated the two men. “First, Buhari was about 75 years when he assumed the presidency in 2015. He looked very much his age, and appeared noticeably frail shriveled due to the ravaging ailments that eventually saw to his demise. On the other hand, Jibril is about 50 years old and it shows in his gait, his vibrancy, and the smoother tone of his face and skin. There’s also the slight difference earlobes between the two men. 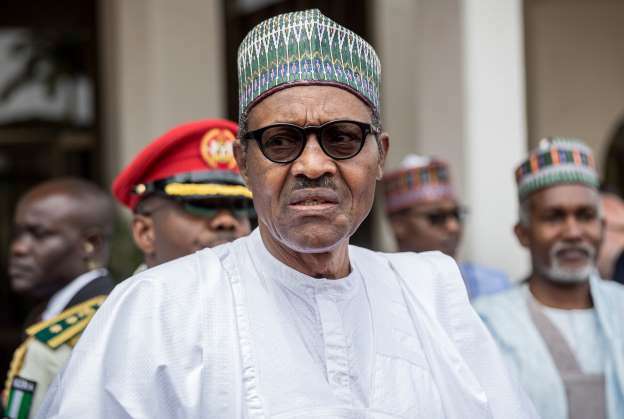 “Sixth, since his ‘acclaimed’ recovery from his debilitating ailments and discharge from the London Hospital, the man that claims to be Buhari has not been traveling to London for mandatory follow-ups. Is it medically possible that someone who was ravaged to the point of looking skeletal and underwent complex surgeries would suddenly heal to the point that he no longer needed clinical follow-ups? Plus, when this Jibril story persisted in the wake of his US visit with President Trump, his handlers tried to defuse it by orchestrating a medical check-up stopover in London. If such check-ups are real, why isn’t this being done on a regular basis since his so-called recovery.